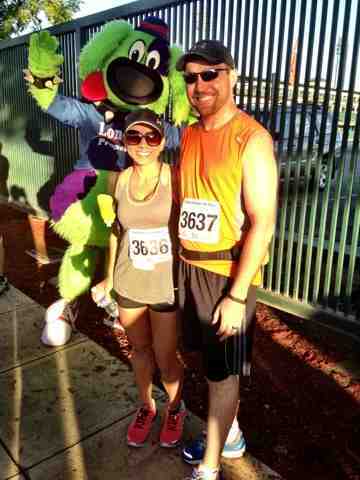 Another half marathon with the hubby?!? Yes please! It's such a great bonding experience and I highly recommend it. I have to admit, it is hard for us to both train for marathons while having a 5 and 6 year old who are very active and busy kids. 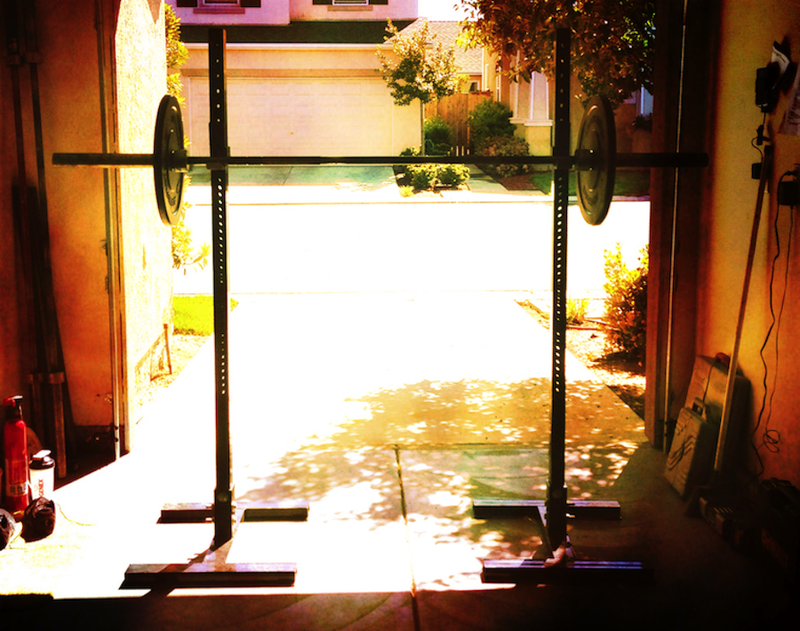 It definitely takes balance, dedication, early mornings, and planning. However, it is truly an amazing thing to experience with your significant other. I didn't wake up the morning of the half marathon feeling 100%. For one, I was EXHAUSTED! I had been helping out with a fundraiser with the youth group at my church to raise money for a mission trip to Canada we are going on in July. Then I got less than four hours of sleep two days before the marathon and about 5 hours of sleep the night before the marathon. I felt like I was "drunk tired." I also decided to make a super smart choice by having wine and gatorade (which I rarely drink.... the Gatorade, not the wine;)the night before the marathon. Uh, yea..... Not ok! It was super yummy going down, but my tummy did not like me in the morning. Between the exhaustion, the wine stomach ache, and the stomach pains from being nervous and anxious.... Lets just say I was in the stinky porta potties by the start line way more than I should of been. 1 hour and 50 minute pacer. It was go time! Everyone counted down loud and proud..... 3, 2, 1, Go! 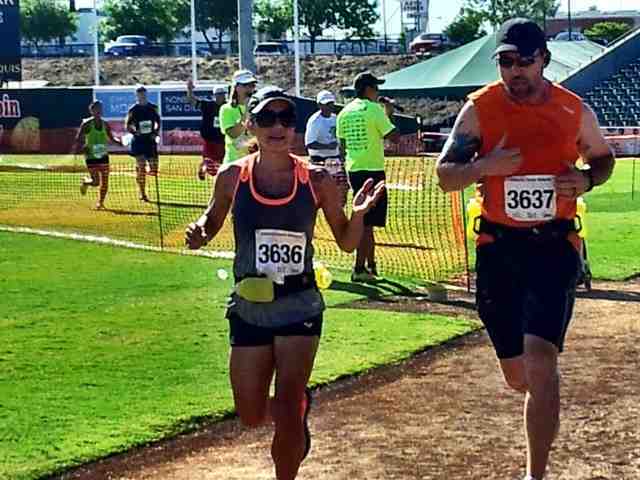 The start is always the most difficult and frustrating because you are running with hundreds of other runners trying to get to your race pace. Everyone is way to close for comfort. We started off running next to the 1:50 pacer, but very shortly after the race started, we gradually got further and further ahead of the pacer. Mike (my husband) set a 1 hour 50 minute goal, and we were well on our way to beating that goal from the beginning. We were keeping a pretty steady pace that ranged from 8:05-8:20. Mike was rocking it! 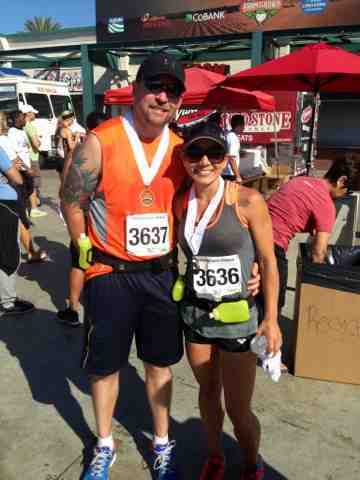 My hubby runs faster than your hubby! ;) I couldn't resist. I had to add that in there. I love running with Mike, even though we are both at a different paces. 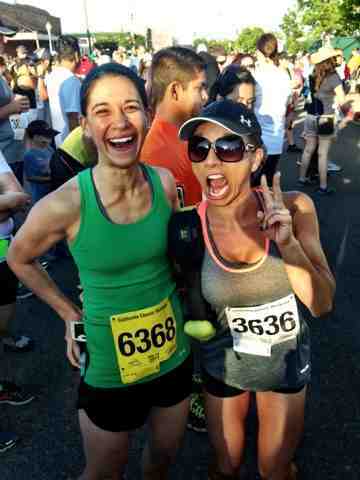 We promised each other that if we are running in a race together, we will always stick together no matter what. In all honesty, I sometimes struggle with that. Not because I don't want to run with him, but because my body and mind are not communicating! For my runs (1-16 miles) I usually range from a 7:30-7:50 pace (16+ miles I'm around a 7:50-8:00 pace). The higher the mileage, the slower your average pace gets. 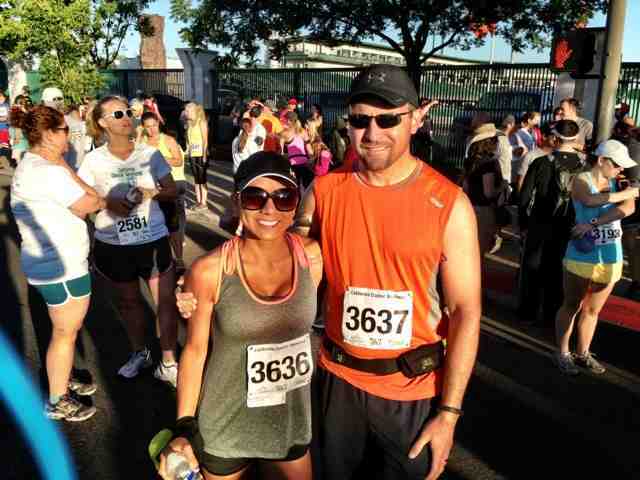 In my mind, I know what pace I should be at when I'm running with my hubby, but my body tries to go faster! It's beyond frustrating! But once Mike and I get in to that groove, we are right on track with each other. Let me describe the race course for you in a nut shell. It took place in Fresno, California. Enough said, right? Fresno is not too exciting. 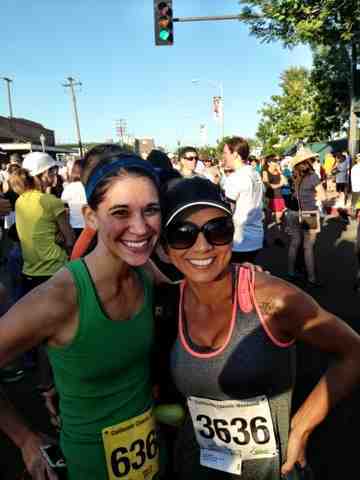 It was perfect temperature, but the sun was beating down on us for a good chunk of the run so it felt much hotter. There were very few spectators compared to any other marathon I've done. But the spectators that were there were amazing! They were loud, playing music, handing out water, and cheering us on! That's what I love! It's what keeps you going. We were not running through the best part of town in my opinion. However, we did run through the Zoo and through the Sea Lion Cove which was pretty awesome. The finish line was also located in Grizzly stadium on home plate, which was also pretty freaking awesome. There were also lots of smells. Now, just so you know, I have a very weak stomach when I'm running. I can't handle different smells. Period. Last year, I was on a 20 mile run with a friend, and she decided we should take a different route. We ended up running past a bunch of cows. The poop smell was so intense I could not tolerate it! I ended up puking, A LOT, all over the dirt. Not very attractive, but we kept on running. No excuses, right? Ok, back to the race day smells. We smelt trash, bacon, other food items, bad air, cigarette smoke from some of the spectators (No joke! Common courtesy people), and poop as we ran through the Zoo. Even with all of those smells, I did not puke. Thank God! Mike and I were going strong and enjoying the experience with each other! We had quiet moments and moments where we were having full conversations with each other. That's what I love about running. You can run with someone for miles, and not say a word to each other. We were quickly approaching the finish line. A few miles to go and we were feeling the heat, the tired legs, and the exhaustion. We powered through it! Surprisingly, our last 3 miles were quicker than the first 10. I heard people cheering and the announcer calling out names as runners crossed the finish line. I knew the finish line was right around the corner. 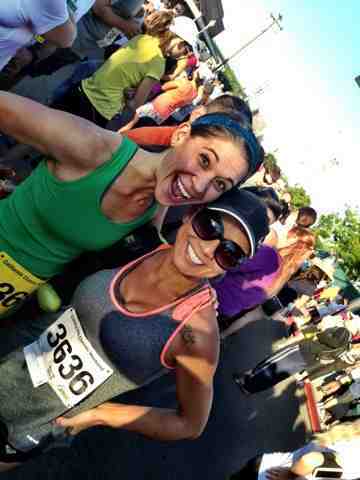 We turned right, ran down the hill in to the stadium, and sprinted to the finish line holding hands! We crossed the finish line in 1 hour and 49 minutes, setting a PR for Mike! How awesome is that? I got to run with my hubby and witness him set a PR. He truly amazes me more and more each day. I couldn't be more proud of him in all that he does. 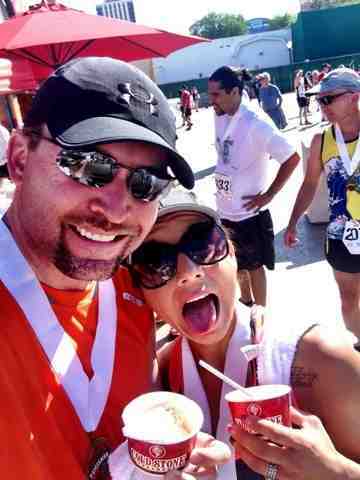 After we crossed, we got a bottle water, our medal, and headed straight for the free food and ice cream from Cold Stones! Peanut butter ice cream, pancakes (I couldn't have any since they didn't have gluten free pancakes there), eggs, sausage, and fruit. It was amazing! Celebrated a victory with the love of my life, food, and ice cream! It couldn't get any better than that. The only thing we were missing, were our sweet babies. We had our babysitter take them to church with her instead of taking them to the marathon. Marathon running is such an addiction. You get such a runners high from running that many miles. Only 2% of the world will complete a full marathon (not sure on percentage for 1/2). That is crazy! 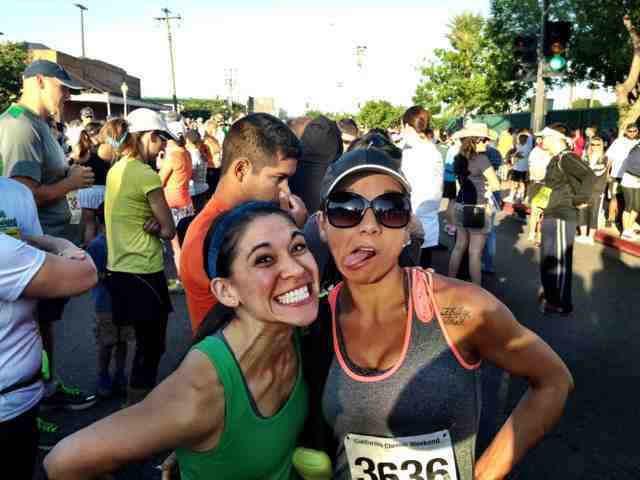 I absolutely adore the running community! It's a big little community of awesomeness and I'm so proud that my husband and I are a part of that.